I found a pretty cool new navigational tool called SAS Planet. How do I know it’s cool? Well, I like it so much that I’m taking a break from editing YouTube videos and invading Amy’s blog space to tell you about it. That’s pretty much the highest level of coolness. 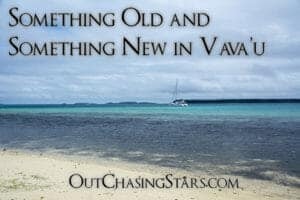 Last year we noticed that our charts weren’t as accurate in the South Pacific as they were in the Atlantic. 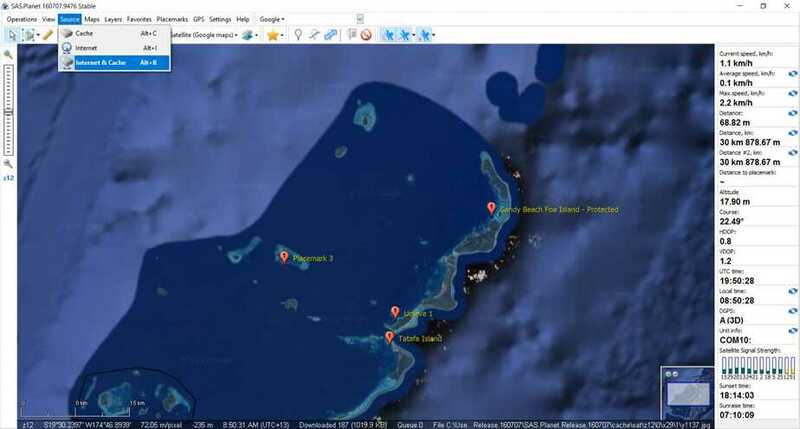 Cough… Beveridge Reef and Fiji… cough… Fiji actually has pretty decent cell coverage so we were using our data plan to pull up Google Maps while we were out sailing. That allowed us to supplement what we could see in our Navionics charts. It worked well, but what about when we were in places that had a lack of cell phone coverage? For example: pretty much every other country we’d been to in the South Pacific. Enter SAS Planet. 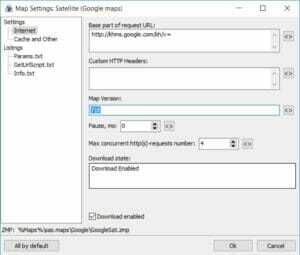 It allows you to download and save offline satellite imagery from Google Maps, Bing and a bunch of other sources. We can then use these images to plot a route through reefs and bommies, all within SAS Planet, then export that route into a GPX format, which can then be imported to our Raymarine chartplotter and OpenCPN. See, I told you it was cool! Now on to the nitty gritty details about how to actually use SAS Planet. 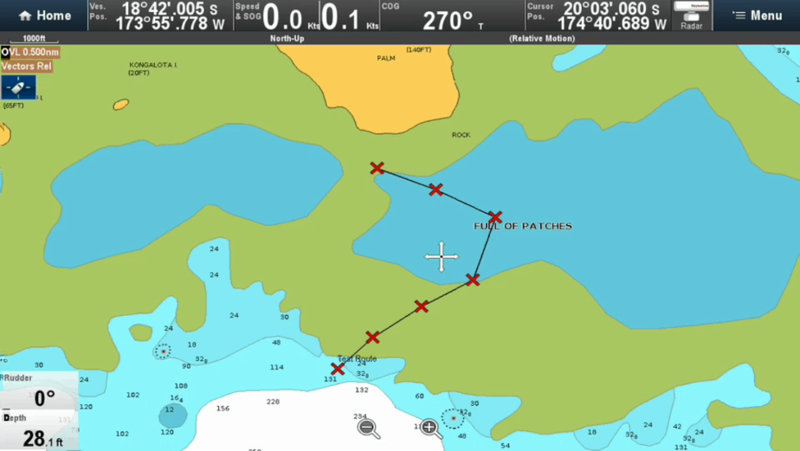 In truth, a computer is all you really need, but having a GPS puck will allow you to follow your track and your boat’s position in real time. 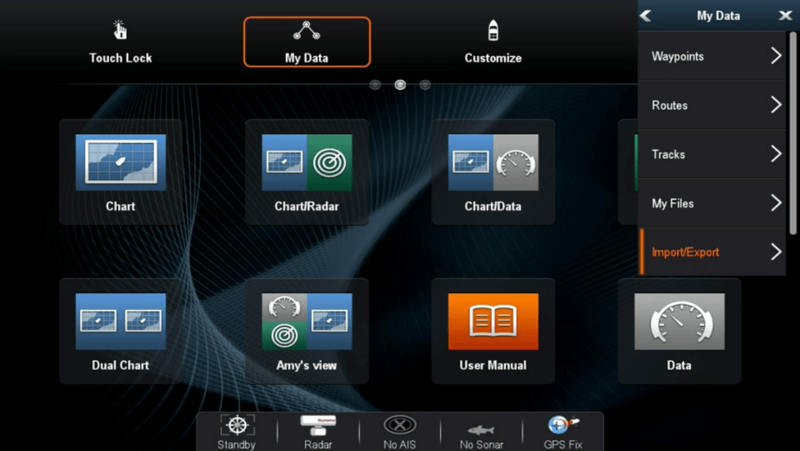 SAS Planet isn’t a substitute for an actual navigation program or plotter but it is a really nice addition. Installing SAS Planet should be pretty simple and straight forward, except for one slightly major issue. 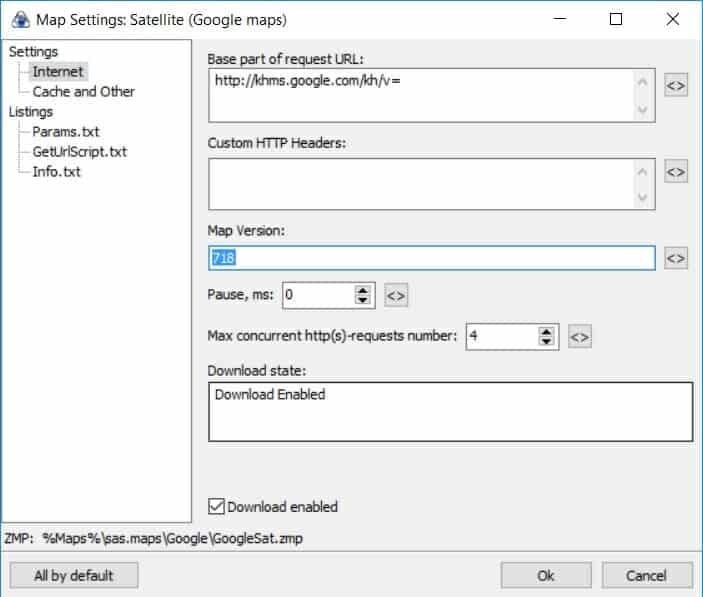 Google Maps can’t be downloaded via the default settings. Don’t panic, it can be fixed. Go into the ‘Settings’ Main Menu and choose ‘Options’. 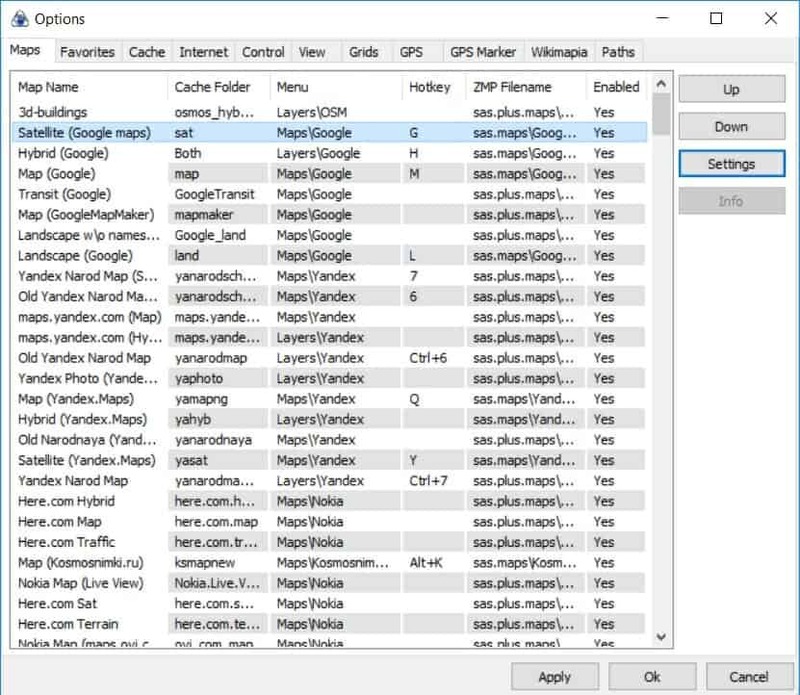 In the ‘Maps‘ tab, select ‘Satellite (Google Maps)’ and then hit ‘Settings’. Make sure that the Map Version is set to 718 and then hit ‘Okay’. See, no need to panic. 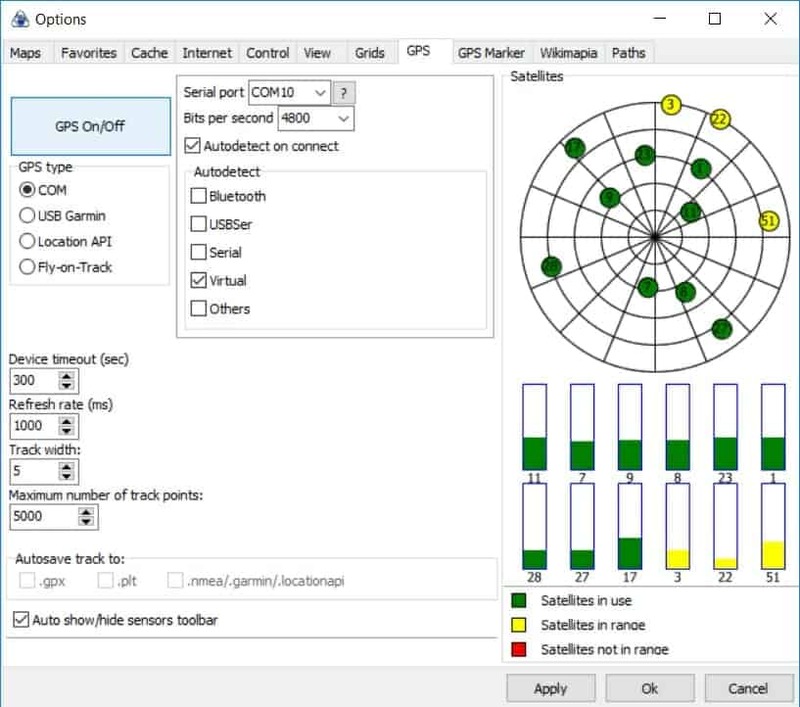 Now we need to connect SAS Planet to the GPS puck and that gets a tad bit complicated. For some reason, SAS Planet refused to recognize that I had a GPS puck entered into a USB port. A bit of internet research later and I found out about FransonGPS Gate. 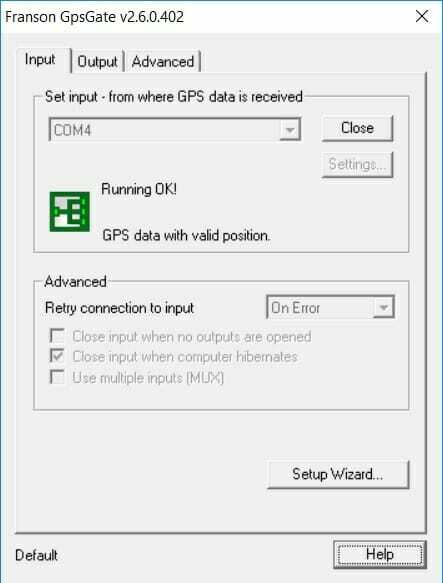 It is a program that takes a GPS input and outputs the information to several virtual USB ports (aka COMS). 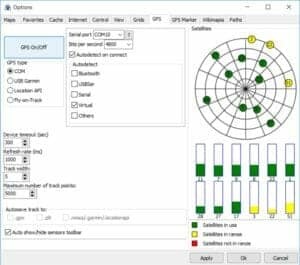 SAS Planet had no problem recognizing one of those virtual COMS and you can also set up OpenCPN to use a virtual COM as well so you can get GPS data into both programs simultaneously. We have our GPS puck in the USB port designated as COM4. Don’t worry if you don’t know what COM number you should use. 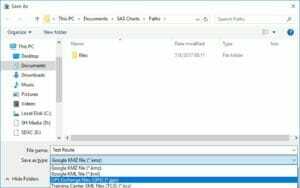 Try the trusty Setup Wizard or use good ol’ Mr. Google for some help on how to use your computer’s Device Manager. Once you’ve selected your input COM port, you can set up as many Virtual COM Ports as you want. I’d suggest choosing higher numbers for these ports just to prevent any confusion within your computer. I went with two; one dedicated for SAS Planet and one for OpenCPN. Back in SAS Planet, we need to set up the program to recognize the Virtual COM Port that you just set up. Go into the GPS Main Menu and choose ‘Options‘. On the screen that pops up, make sure that you choose the proper COM Port, check the ‘Autodetect on connect’ and ‘Virtual’ boxes. Next we need to download some satellite imagery but before we get started, I’d strongly suggest that you connect to a fast and unlimited internet connection. 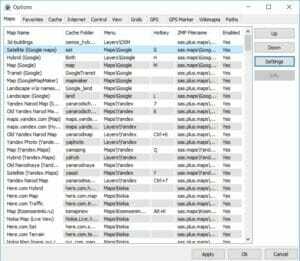 You can rapidly run up some large file sizes depending on the area you’re downloading and the various zooms you desire. That being said, I know how rare that is once you’re out cruising, so I’ll try to share a few tips to manage how much data you’re using. SAS Planet allows you to pick the source of the satellite imagery you want to download. This is extremely useful as one source may have some cloud cover and another may have a clearer picture. 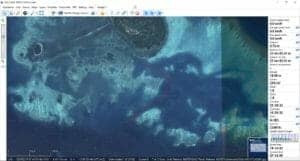 I usually start with Google Satellite and then try Bing if I feel I need some additional detail. Those two seem to have the most extensive imagery available. 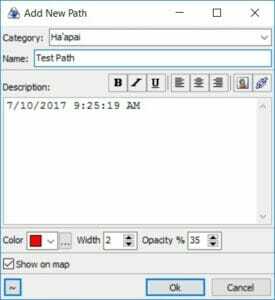 Once you’ve selected which Map you want to use, there are two ways to download the maps: the fast, automated way and the slow, manual way. If you’re trying to download large areas and have that mythical unlimited internet, the Rectangular Selection tool is the easiest to use. 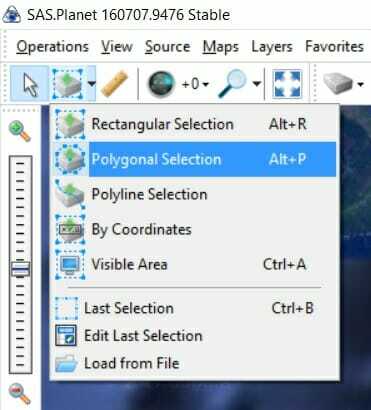 If you’re looking at a specific anchorage and trying to conserve some of your crappy cellular data, I like the Polygonal Selection Tool. It allows you to choose a more detailed area for downloading. 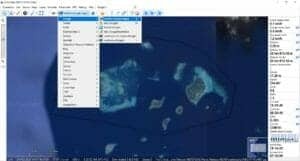 SAS Planet downloads the satellite imagery in tiles, so the more specific you can be about the area you want, the less tiles and data you’ll need. Once you’ve got your area selected, hit the Green Check Mark in the popup box to bring up the Download Options Menu. Lower numbers are the far-out zooms and the higher numbers are the closer-in zooms. Obviously the closer in the zoom, the larger the file size needed to download. 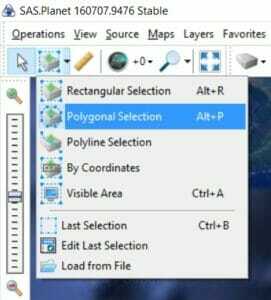 For each box you check, SAS Planet will download that zoom for the area you have selected. I’ve found that choosing three zooms, 10, 15 and 18 gives me a pretty good mix of overview + detail without making the download size too unreasonable. But when I get lots of internet, you can be sure I’ll be going pretty crazy downloading lots of zoom levels! You can set up SAS Planet to download whatever you’re viewing on the screen. If you’re really looking to limit your download sizes, this is the way to go but it takes a long time as you must scroll around at every zoom level (you can see your zoom level on the left-hand side) and wait for the tiles to download. 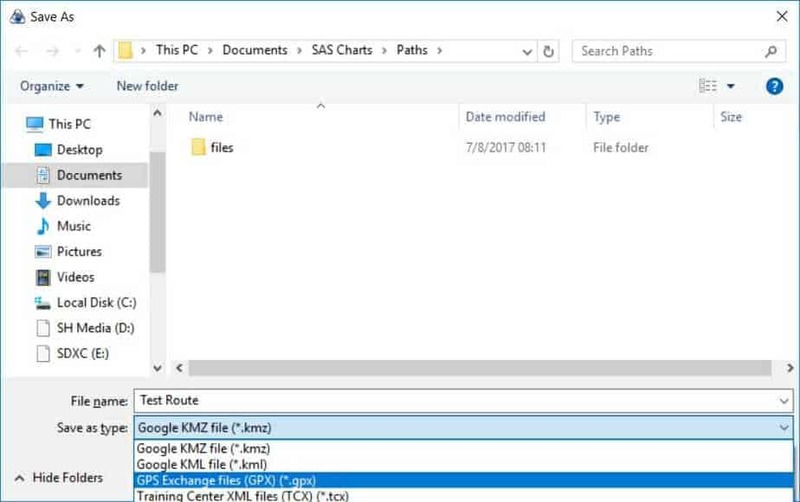 Make sure you have selected ‘Internet & Cache’ as this will download the maps to your computer for offline use later. 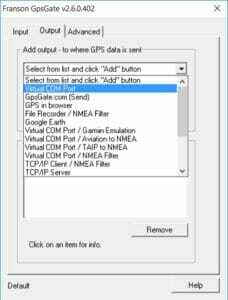 If you want to navigate around using maps you’ve previously downloaded without using data to download more maps, select ‘Cache’. 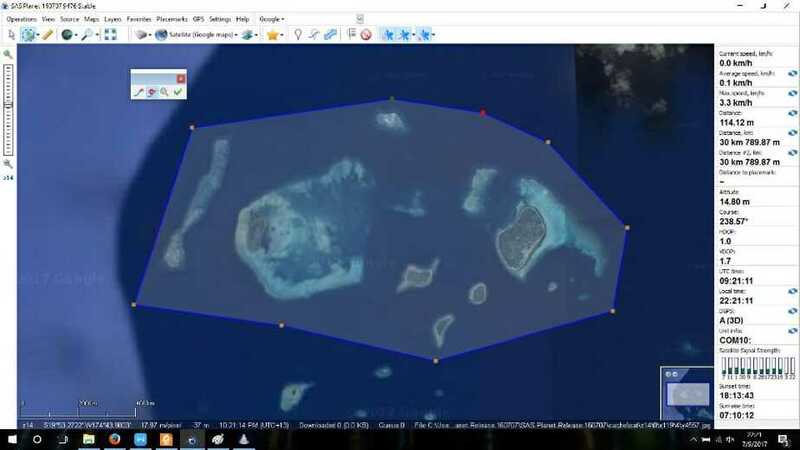 With all your satellite imagery downloaded, it’s time to work on creating a route you can use as a guide for navigation. There is an icon in the menu bar called ‘Add a new path’. You can now add waypoints and create your path. 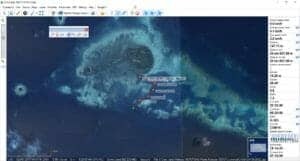 I usually start on one of my ‘overview’ zooms before zooming in for more detail and making sure I’m not heading over a bommie. You can adjust the waypoints so you just need to get the path close to start with. Once you’re satisfied that you have the path set up to avoid treacherous bommies and rocks, you can save it. 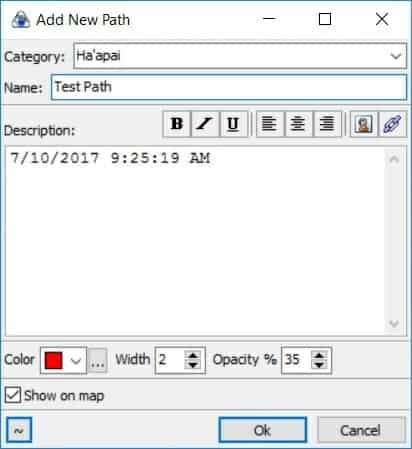 SAS Planet allows for different categories for your paths so I try to group them by geographic area. Choose whatever name you want for the Path. Once that is done, we need to go in to the ‘Placemark Manager‘ so we can export the route into a usable format by our chart plotter. Select only the path you want and choose the drop down box by ‘Export’. 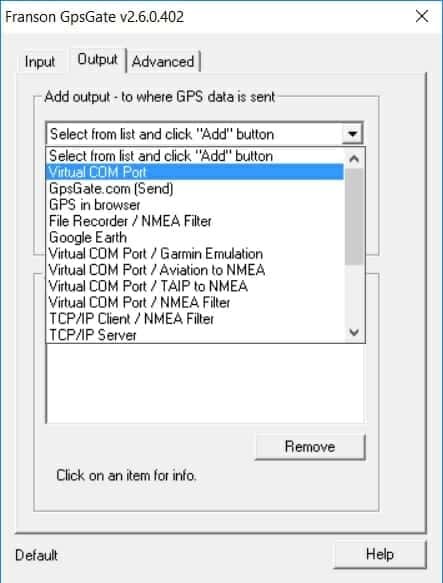 Select ‘Export Visible Placemarks’ otherwise SAS Planet will export all tracks and waypoints to the file and that will cause issues importing it into the plotter. 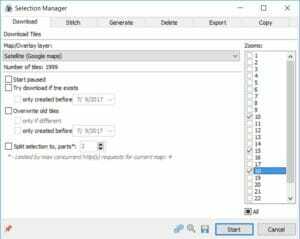 Make sure you select a folder on your computer that you will be able to find later. Our Raymarine plotter is capable of importing GPX routes and conveniently enough, that is one of the formats you can save to. I have no idea about the types of files used by other plotters so you’ll have to do some research and find out. 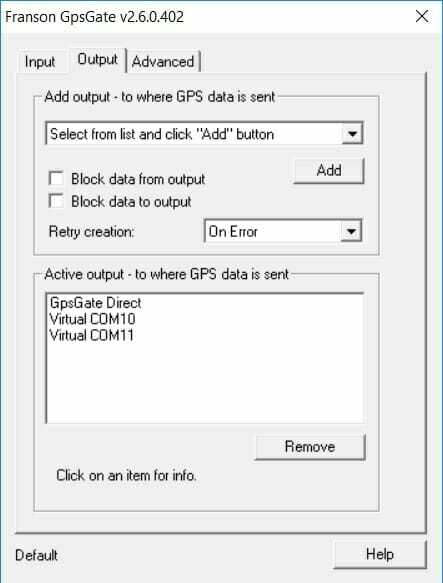 If you need another format than what SAS Planet offers, that’s what GPS Babel is for. 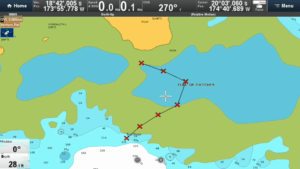 Having a carefully planned out route is quite nice, but it’s way more helpful to have that information also available on our chart plotter while we’re navigating our way through the reefs. To import into our plotter we need a microSD card. 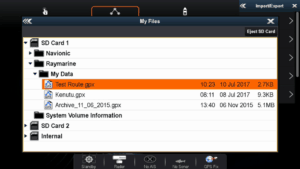 So far I’ve just been using the ones that store our Navionics charts. 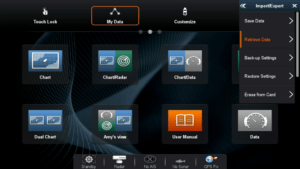 Put the microSD card back in the plotter and navigate to the ‘Home’ screen. 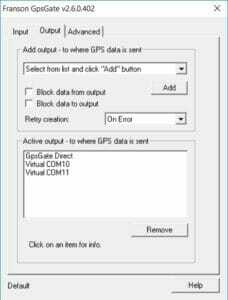 Select ‘My Data’ and scroll down to ‘Import/Export’. Select the route you just saved. 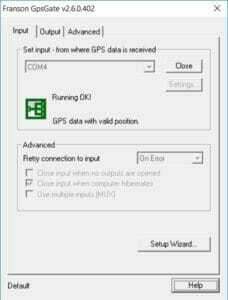 The plotter will then automatically import the route. You can then go into your charts and marvel at how awesome it is that you now have a source that will let you find paths through reefs that you never would have found using just your chart plotter! THIS IS VERY IMPORTANT!!! SAS Planet is a tool and you should not rely on it with unfailing confidence. You should always keep a lookout when navigating through difficult areas. I don’t want to hear from anyone that they hit a reef because they were just following a route they created in SAS Planet. Keep a lookout and use common sense! Have fun exploring uncharted destinations! Love the concept but it fails at the download-of-maps step. When I select an area around me and try to get the image tiles, all I get is “Tile not found!”, after repeated attempts with different zoom levels. Can send screen snaps, any debugging clues you can offer would be welcome. Hi Royce. Are you trying to use Google Maps? I’ve been having a few issues with them recently as well. I’d suggest trying the ARC.GIS.Imagery source. 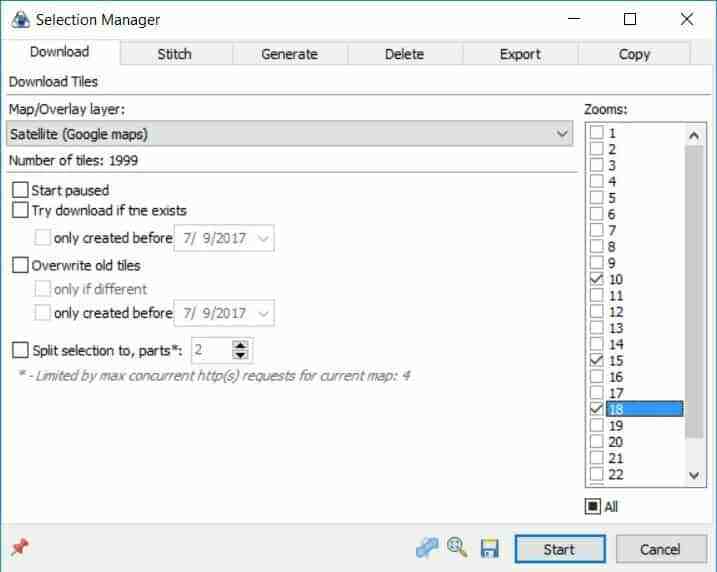 It can be found under ‘ESRI’ in the source menu. Let me know if that works and I’ll try to update this post with that info. Haha, reading idiot format is how I learn best so I figured it’s only fair to explain things that way too! We’re going about as slow as we can, so I’m afraid it will be you who has to speed up to catch us! 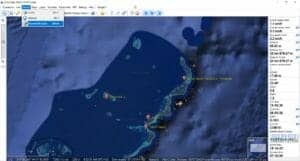 Are you guys planning on going down to NZ for cyclone season this year? Cool post David and great step by step directions 🙂 I love nerdy tech stuff like this! Thank you David, very easy instructions to follow thanks again for taking the time to put this info on paper. Like your Vids keep up the great work. Thank you very much! It’s always nice to know that the effort can be useful to others! Thanks mate! Even I think I can follow these instructions! You’re welcome. I remember the charts being pretty bad in Fiji so I hope it helps! David – I will be in complete AWE of you forever and ever!! Right now my landline phone isn’t working. Any suggestions to solve that?? Well thank you! Not sure about the landline other than to say ditch it and go to using only your cellphone. 😉 Love you!